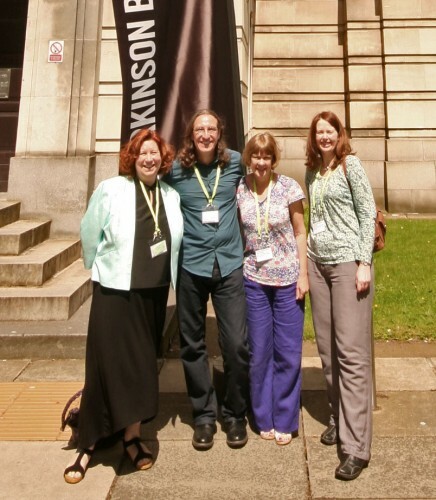 The Monastic Wales crew were at the International Medieval Congress at Leeds again at the 25th such congress. Karen was unable to be with us this year (but was very much there in spirit). Janet and Harriett had masses of support from UWTSD Lampeter: Erica O’Brien from Bristol, a popular part-time lecturer at Lampeter; Paul Watkins, the director of the ‘Monastic Wales’ choir; PhD student Therron Welstead; former MA student Ian Bass (now a PhD student at Manchester Metropolitan University, but still very much ‘one of us’); and undergraduates Natasha Coombs, Eleanor Watson, and Molly Hoffman. We’d like to take this opportunity to thank the students for their support of ‘Monastic Wales’, to congratulate Eleanor and Molly on achieving first class degrees in Medieval Studies, and to wish them well as they embark on an MA, respectively, at Utrecht and York. Our session, ‘Memory, Identity and Emotions in Medieval Welsh Monasteries, was well attended. Janet (‘Memory and History: St Padarn, Llanbadarn Fawr, and the Monks of Gloucester) was sandwiched between two up-and-coming scholars, Ian Bass, who spoke on ‘English or Welsh: the struggle for Dore Abbey’, and Amy Reynolds, a PhD student from Bangor, who was attending her first Leeds. Amy spoke on how religious women were viewed in medieval Wales. In 2019 there will be lots going on, including two sessions organized jointly by ‘Monastic Wales’ and its sister project ‘Monastic Ireland’. 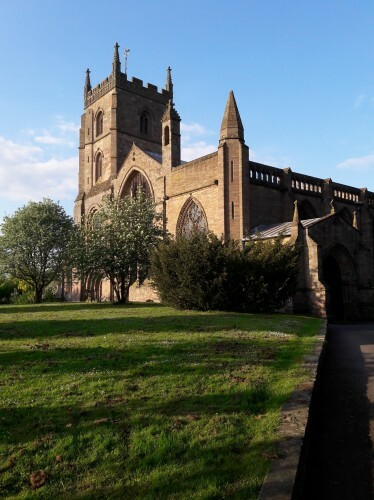 On Saturday 19 May 120 members of the Mortimer Society gathered in the wonderful setting of Leominster Priory Church for their spring conference which this year was devoted to the subject of 'Religion and Faith on the Welsh Marches in the time of the Mortimers'. Janet Burton gave a short introduction to the history of Leominster Priory, and then a lecture on 'Monastic Life in the Welsh Marches'. A number of friends and supporters of 'Monastic Wales' were there too: Professor Helen Nicholson of Cardiff University, a contributor to Monastic Wales: New Approaches (2013) gave a paper on the military orders in the Marches, and Ian Bass (now at Manchester Metropolitan University) talked on miracles associated with St Thomas Cantilupe, bishop of Hereford. Paul Watkins took the photograph of Janet addressing the crowds - and looking very solemn! 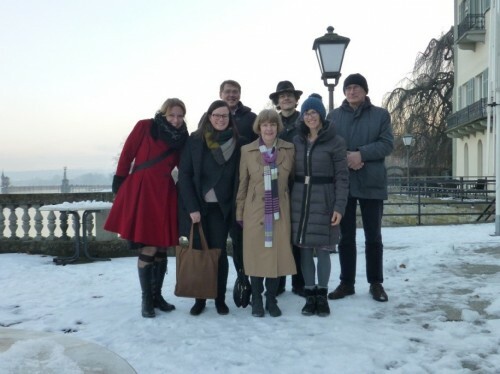 2017 was a busy year for Monastic Wales again, and in September Janet and Karen joined medieval monastic scholars from across Europe at the monastery of Jasna Góra in Czestochowa (Poland) at a conference dedicated to Monasteries in the Digital Humanities. This event allowed them to present the Monastic Wales Project to scholars working on a diverse range of monastic-related websites and digitisation projects. The presence of Monastic Wales at the annual International Medieval Congress at Leeds is now a tradition. In 2017 several of the Monastic Wales team participated in the IMC, where Karen and Janet had organised several sessions, including one, co-sponsored by the Monastic Wales Project and the Ancient Abbeys of Brittany Project, entitled "Money makes the (monastic) world go round: financial use and abuse of monasteries and their benefactors in medieval Europe". Janet Burton delivered a lecture to the Brecon U3A on ‘Nunneries in Medieval Wales’. On 17 February the combined ‘Monastic Wales’ choirs (Cantus Lambed and Canticum Novum) under the direction of Paul Watkins, former research student in Medieval Studies and Director of Music at UWTSD) performed the monastic offices of Sext and Compline in the former priory church of St Mary Chepstow. This was the first occasion that the choirs had sung in a former monastic church which is still today a place of worship. We hope that the experience will be repeated in more monastic sites in Wales in the future, and will increase public participation in ‘Monastic Wales’. Christopher Pearce, research student at UWTSD, has received notification that his PhD thesis has been passed by the Examination Board, and he will graduate in July 2018. Chris’s thesis, ‘Monasticism without frontiers: the extended monastic community of the abbot of Cluny in England and Wales’, is closely associated with the ‘Monastic Wales’ project, and Chris has contributed articles and photographs for our website, Congratulations Chris! The beginning of the year saw Janet and Karen on the island of Reichenau in Germany, at a conference on Island Monasteries, organised by Gabriela Signori from the University of Konstanz, where they presented comparative conferences on the island monasteries of Wales and England to an international audience. Yes, we were there again (well, most of us). We supported a session organized by our colleagues at the Centre for Advanced Welsh and Celtic Studies on the 'Cult of Saints in Wales' project (speakers included our website designer Dr Martin Crampin, and Professor Jane Cartwright, who contributed to Monastic Wales: New Approaches). 'Monastic Ireland' was represented by Dr Rachel Moss. Dr Harriett Webster gave a large audience (despite it being the last session of the day) some ideas about how network theory could be used to build up a picture of the nature of contacts among monastic houses, and how this could be applied to the Monastic Wales Project. We congratulate our long time supporter Paul Watkins on the award of the degree of MPhil from the University of Wales Trinity Saint David for a thesis on 'The Problem of Pendar: a lost abbey in medieval Senghenydd and the transformation of the church in South Wales'. It was a real pleasure to see Paul graduate in July. We look forward to a contribution on Pendar for the website. We are pleased to announce success for another student contributor to the Monastic Wales website. Ian Bass, who took his BA and MA from University of Wales Trinity Saint David, has obtained a funded place to undertake his PhD at Manchester Metropolitan University. At the end of January Janet was the guest of the University of Konstanz where she introduced an audience of staff and postgraduate students to the Monastic Wales project and delivered a paper on 'Monasteries in divided societies: the experience of Medieval Wales'. In March a presentation on the Monastic Wales Project was made to an audience of over 100 people at the U3A Brecon. Our main session at the IMC this year was to provide our friends, colleagues and supporters with updates on the project. In a session dedicated to 'Medieval Monasticism and the Digital Humanities' papers were presented on 'Monastic Wales six years on', and 'Monastic Ireland three years on'. In August we responded to an invitation from our colleagues in Monastic Ireland to participate in a conference held at Ennis in County Clare: Monastic Europe: Landscape and Settlement. This was a marvellous location for a conference, and the papers were punctuated by visits to monastic and mendicant sites with the expert guidance of the Monastic Ireland team and our long time friend Colmán O Clabaigh. It was great to meet and exchange views with colleagues from Ireland, USA, Germany, France, Croatia, Denmark, the Basque Country, Scotland, Finland, Romania and Norway. Karen spoke on 'Tales of war and pilgrimage: the archive of Santa Maria de Vilabertran in Calalunya', while Janet took as her subject 'Tensions in a border abbey: Strata Marcella, its patrons, friends and enemies', or what happened when an English patron tried to get rid of Welsh monks. In January Dr Harriett Webster joined the staff of University of Wales Trinity Saint David to teach medieval history. Harriett is a graduate of Bristol University and before her appointment she was researcher on the 'Swansea City Witness' project. Her PhD thesis was on Ralph of Coggeshall and historical writing - how fortunate Janet was to be joined by another monastic historian. We lost no time in signing Harriett up to the Monastic Wales Advisory Board, and she is busy thinking of ways in which the website might be enhanced. The big Monastic Wales news for the early part of 2015 was the publication of the second book to come out of the MW project. 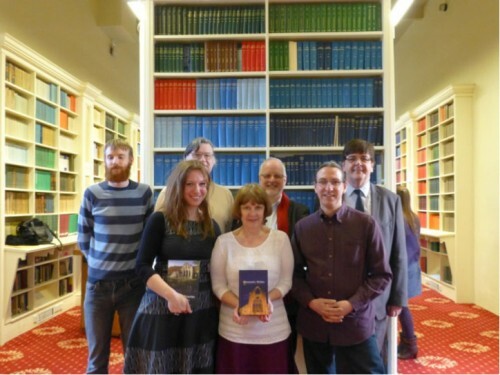 Abbeys and Priories of Medieval Wales, published by University of Wales Press, was launched in Lampeter in March, when we took advantage of Karen's presence in Wales to invite her to deliver a paper to the School of Archaeology, History and Anthropology Research Seminar. The Founders’ Library was packed for her paper and the launch, which was attended by a representative of the Press. It was a delight to have with us research students (notably Therron Welstead and Paul Watkins) who have done so much to help with the project. The early part of 2014 was rather quiet, but things got busier from May onwards. At the beginning of the month Janet took 'Monastic Wales' to Canada, when she delivered one of the keynote lectures at a conference in Toronto entitled 'Cistercians and Canons Regular in Medieval Brittany, Normandy, England and Wales', and organized by the Ancient Abbeys of Brittany Project. Part of the conference was held at York University in North Toronto, and part at the U of T downtown campus. This was a wonderful forum at which to present her paper on the Cistercians in Wales and on the Welsh Border - there is so much Canadian interest in Wales. The Canadian adventure was followed rapidly by two 'Monastic Wales' presentations, one to the Swansea Historical Society, delivered in the Founders' Library in Lampeter, and the other to a day seminar at St John's College, Oxford, on ‘Cultural Encounters on the Medieval March of Wales’. Monastic Wales was once again prominent at the International Medieval Congress in Leeds in the organization of sessions which provided a forum for papers to be presented that were directly related to the project, and to our 'sister' project, Monastic Ireland. Those who delivered papers included Paul Watkins, a research student at University of Wales, Trinity Saint David, who is working on the 'lost' Cistercian abbey of Pendar, and Irish colleagues Anne-Julie LaFaye, Niamh NicGhabhann, Malgorzata Krasnodębska D’Aughton, and Keith Smith, as well as a colleague from Portugal, Catarina Almeida Marado. Academic collaboration with colleagues in Ireland continues to flourish. 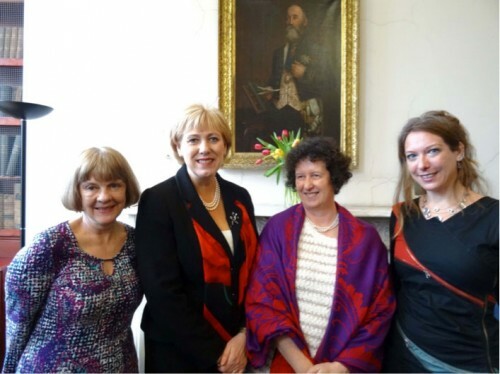 In December 2014 Janet and Karen attended the launch, in Dublin, of the 'Monastic Ireland' project. This was developed under the leadership of Dr Edel Bhreathnach of the Discovery Programme on the model of Monastic Wales. During the launch by the Irish Minister for Arts, Heritage and the Gaeltacht Dr Bhreathnach paid tribute to the inspiration that Monastic Wales had provided. One of our colleagues who had a very busy year was Martin Crampin. Not only did he complete and publish his book Stained Glass from Welsh Churches, which contained several images from monastic houses in Wales, he also exhibited his images based on the tiles at Strata Florida at exhibitions in west Wales at Narberth and Tregaron. These images are based on the patterns of the fourteenth-century tiles, and formed part of his PhD exhibition, 'Patterns, Monsters and Mysteries', and at Oriel Q, Narberth, were exhibited with some tile fragments from the abbey. We are delighted to announce the appearance of Monastic Wales: New Approaches edited by Janet Burton and Karen Stöber and published by University of Wales Press. The volume contains fifteen essays organized around four main themes: Foundation, Transition and Transformation; State-Building, Authority and Power; Movement and Social Interaction; Cultural Identity and Production. Contributors are Andrew Abram, David Austin, Jemma Bezant, Janet Burton, Jane Cartwright, Arlene Hogan, Kathryn Hurlock, Dafydd Johnston, Ceridwen Lloyd-Morgan, Anne Müller, Helen Nicholson, Jens Röhrkasten, David Stephenson, and Karen Stöber. To Dr Edel Bhreathnach, a member of our advisory board and the director of the ‘Monastic Ireland’ project on her appointment as CEO of the Discovery Programme, the main Archaeological/Historical arm of Ireland’s Heritage Council. We wish her well in her new post. Edel and Janet will be taking Monastic Ireland and Monastic Wales to Stirling in July, to a conference entitled ‘Plantations Amidst Savagery? The reformed monastic orders in North Europe c. 1100 to c. 1600’. We have been successful in an application to the European Science Foundation for financial support for a workshop ‘In the shadow of empires’, to be held in December 2013. This will bring together invited international scholars (currently we have acceptances from scholars from from Vienna, Prague, Göttingen, Kassel, Budapest, Dublin, Madrid, Leeds, as well as Wales and Catalunya) to discuss aspects of the role of the reformed monastic orders in the processes of state building. The workshop will be held in Eichstätt, Germany, and hosted by Dr Anne Müller, to whom we are indebted for masterminding the application. Thank you Anne! Karen and Janet are delighted to announce the appearance of volume 1 of a new international journal of which they are the general editors. The Journal of Medieval Monastic Studies (JMMS) is published annually by Brepols, Turnhout, Belgium. We have a new addition to the Project team. Naomi Johnson, who has an MA in Medieval and Early Modern History from Bristol and who is now living and working in Bangor has volunteered her services to Monastic Wales as a researcher. We are grateful to her for her help. Welcome aboard, Naomi. In early November Karen took Monastic Wales to Canada. Following her paper at the North American Conference on British Studies (NACBS), she handed out MW flyers and bookmarks to an interested audience who will hopefully boost the numbers of our north American readership. Janet was up and about as well, though her travels did not take her as far afield. 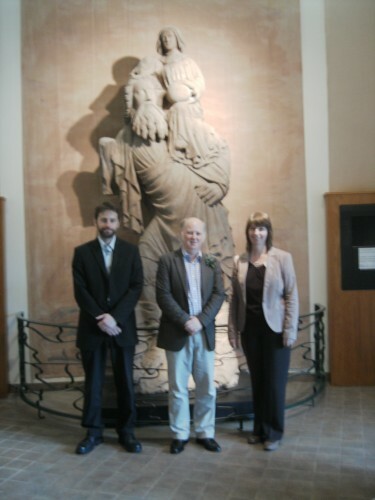 She was invited to deliver the 2012 J. E. Lloyd lecture at Bangor University, on the Monastic Wales project. We have news from Anne Müller in Eichstätt, who recently attended a workshop at the Institute of European History of Art at the University of Heidelberg, on the theme of space within Franciscan friaries - of problems identifying the original function of claustral buildings, of the physical structure and symbolism of claustral compounds, and spatial relationships between the inner monastic and outer secular worlds. Anne's paper considered conceptions, structures and meanings of Franciscan spaces in Wales. She looked at the three houses that the Franciscan Order built in Wales, c. 1250 - Llanfaes (a foundation of the Welsh princes in Gwynedd), Cardiff (built close to the castle of the English lords of Glamorgan), and Carmarthen (a royal foundation in a royal town) - to show how religious space in this politically fragmented society was constructed and used to support distinct, and, as in the case of Wales, competing cultures and identities. The friars have arrived on the MW website! Thanks to the efforts of our researcher, Julie Kerr, the friars now appear on Monastic Wales. Please note that information on individual houses of friars is still being added to the website, but you can already enjoy this new, and important, element of Monastic Wales! Keep an eye open for articles on the friars by Dr Anne Müller. Events across the border in Cheshire…. Dr Andrew Abram, lecturer in Medieval History from the School of Archaeology, History and Anthropology, University of Wales Trinity Saint David and a member of the ‘Monastic Wales’ team recently strayed across Offa's Dyke to help celebrate St Augustine’s day at Norton Priory Museum in Cheshire. Founded in 1134 as an Augustinian priory, Norton is the best excavated monastic site in Europe and preserves its twelfth-century undercroft. Norton Priory Museum and Gardens in Runcorn has received initial support from the Heritage Lottery Fund for the project, Monastery to Museum - Norton 900. Development funding of over £250,000 has been awarded to help the site progress its plans to apply for a full grant at a later date. Andrew, who has been involved with the museum for over 10 years, gave a lecture on the significance of the Augustinians and Norton Priory. He has been invited to participate in compiling a research document for the future development of the site, and is currently working on an edited collection of the charters of the house. Although it is only a month since our last ‘news’ we did not want to delay in announcing that we have three new members of our advisory board. We are delighted that Professor Blanca Gari of the University of Barcelona, Professor Petr Sommer of the Centre for Medieval Studies at the University of Prague, and Professor Dr Hedwig Röckelein of the Georg-August-Universität Göttingen, have agreed to join us. Since our last report in March 2012 the Monastic Wales team has continued to be busy. Our researcher, Dr Julie Kerr, honorary fellow of St Andrews University, has been working away on the website, with the addition of more photographs, and bibliographical and archival sources, and details on standing remains. Ian Bass, who has just completed his BA in Medieval Studies with a first class honours degree (congratulations Ian!) has joined the team and gathered together material on the foundation of houses of friars. As Ian is intending to return to Lampeter for his MA in Medieval Studies we look forward to more contributions by him. At the end of our March news we stated that we would be taking Monastic Wales to Prague and Dresden, and so we did. Dr Anne Müller, who last year was a visiting fellow at the School of Archaeology, History and Anthropology at University of Wales: Trinity Saint David, was awarded a short term fellowship at the University of Prague’s Centre for Medieval Studies this spring, and arranged for a workshop at which Karen and Janet were able to make a presentation to our Czech colleagues on the Monastic Wales project. This was well received, and we hope that the visit will lead to research collaboration between us and scholars in Prague working on monasteries in medieval Bohemia. Janet went on from Prague to Dresden, where she lectured to a seminar at FOVOG (an international centre for the comparative study of religious orders) and where she took the opportunity to spread the word about Monastic Wales to a German audience. 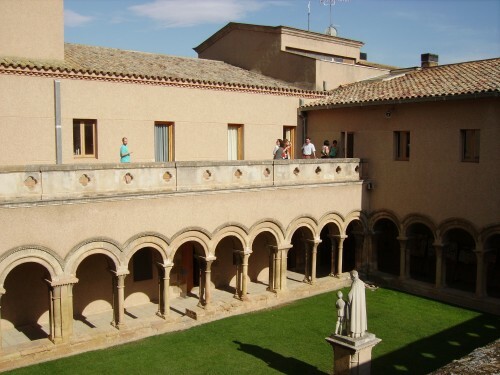 Early July saw a whole troop of researchers from the Monastic Wales and Strata Florida projects - Karen, Janet, Julie, Anne, and David Austin - in Catalunya, for the annual conference organised by Karen and Janet for the University of Lleida at the Monastir de les Avellanes near Balaguer. This year it was on the subject of monastic space in the medieval monastic world. Julie delivered a wonderful paper on monastic hospitality and space in the medieval monastery, and Anne on ‘Creating heaven on earth: concepts of space in medieval cloisters’. Both projects loomed large in David Austin’s magisterial presentation on Strata Florida, entitled ‘Sacred space and sacred landscape’. 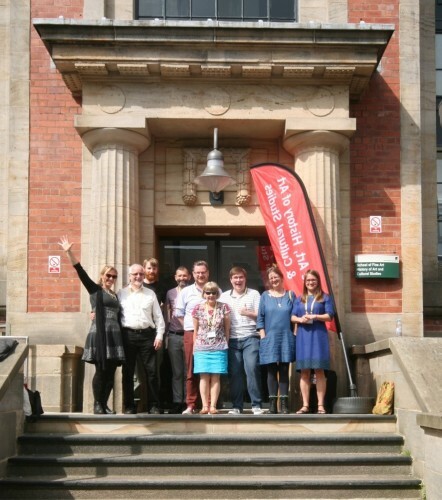 As usual July also saw Karen and Janet at the International Medieval Congress at Leeds, where ‘Monastic Wales’ sponsored one session and Janet and Karen participated in a panel organised by the international journal Cîteaux: Commentaria Cistercienses. Those who attended (impartial observers we hasten to add!) voted these sessions among the best of the entire congress. We are grateful to Dr Jane Cartwright of TSD, Tracy Collins of University College, Cork, and Kimm Curran of Glasgow University for their splendid papers on medieval religious women: Jane on the Middle Welsh life of St Ursula, Tracy on the archaeology of female religious houses in Ireland, and Kimm on nunneries in Scotland. We are happy to report that we now have a publication date for the collection of essays, Monastic Wales: new approaches, by University of Wales Press. All being well it will appear in March 2013. From the beginning we intended the website to be interactive, and we have been gratified by the responses we have had, as you have e-mailed us with your views on the website, and pointed out errors and omissions. Thank you - it is appreciated. Bardsey; Carmarthen; Cymer; Llangua; Llantarnam; Maenan ; Malpas; Pill; Puffin Island; Ruthin; St Tudwal’s Island; Caldey; Haverfordwest. The last eighteen months have been a busy time for the ‘Monastic Wales’project. Work has continued apace on the website, courtesy of our researcher, Dr Julie Kerr, honorary fellow of St Andrews University. Several articles have been added to the portfolio, and the web pages of the individual houses have been enhanced. Janet Burton and Karen Stöber (who in February 2011 took up a prestigious research post at the University of Lleida, Catalunya), have been out and about giving presentations to increase awareness of the importance of the project. They were both at the Ceredigion Local History Forum, and at the Medieval Wales Colloquium (Bangor) in late 2010. Janet gave a presentation as part of a lecture on Valle Crucis to the local branch of the National Trust in March 2011, and followed this up with a tour of Valle Crucis during the branch’s summer day out in June. They were both in action at the English Monastic Archives Conference at University College London in June (reminding the audience of the importance of what happened west of Offa’s Dyke!). ‘Monastic Wales’ sponsored two sessions at the International Medieval Congress at Leeds in July, which were well attended. Word is getting around! A further round of action continued with the academic year 2011-12 and in the last month alone Janet has lectured on ‘Monastic Wales’ to local history groups in Carmarthen, Llansantffraed and Llanidloes. 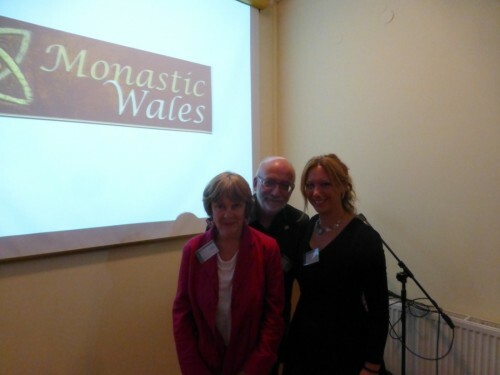 Further afield Karen presented ‘Monastic Wales’ at the International Medieval Meeting in Lleida in July 2011, and a week later Janet and Karen gave a short introduction to the project to delegates of the annual monastic conference in Catalunya which they co-organize. In September Karen took Monastic Wales to the annual CARMEN (‘Co-operative for the Advancement of Research through a Medieval European Network’) conference at Segovia, where the project was enthusiastically received. A workshop held at Lampeter in June with colleagues from Ireland, aimed at exploring collaborative research projects, resulted in a pilot project, led by scholars from University College Dublin, to produce a website using Monastic Wales as a template. This Summer we will be taking ‘Monastic Wales’ to Prague and Dresden. Meanwhile Janet and Karen and the interdisciplinary team of scholars they have brought together have submitted a collection of essays, Monastic Wales: new approaches, to University of Wales Press, where it is going through the processes of publication. Their next task will be the completion of a more popular book, Abbeys and Priories of Wales which was commissioned by UWP.